National Teams from Japan and Chinese Taipei will play an officially sanctioned three-game exhibition series in Taipei City from Thursday, November 8 to Saturday, November 10, 2013. Federations use an increased amount of resources to bolster their national team activity. Last year Cuba traveled to Asia to play against Chinese Taipei and Japan. During this summer the Czech Republic hosted Chinese Taipei. And the Collegiate National Team from the United States played a pair of friendship series versus Japan and Cuba. All of them were officially sanctioned by the International Baseball Federation (IBAF). 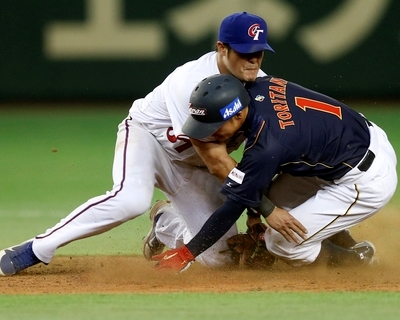 The highly anticipated “Samurai Japan/Chinese Taipei Baseball Challenge” features a selection of professional players, amateur talent and prospects from each country, as managers kick off preparations for next year’s Asian Games. Three sold out games are expected, as both squads use the opportunity after the completion of the professional baseball season for national team competition on the international stage. Japan recently has created a new website dedicated to Samurai Japan, as interest in their national teams continues to be on the rise. For new manager Hiroki Kokubo the series in Taipei City is going to be his official debut at the helm. Samurai Japan/Chinese Taipei Baseball Challenge sees the number three and four of the Men’s Baseball World Ranking squaring off. Both rivals last met during the second round of the 2013 World Baseball Classic in March of this year. Japan won 4-3 en route to the semi-finals. Games will be played at Xinzhuang and Tianmu Baseball Stadiums in Taipei City, venues which have hosted international tournaments like the World Baseball Classic Qualifier and Baseball World Cups in the past. All three games will be broadcasted live in Japan (TV Asahi, TBS) and Chinese Taipei. Interest in national team encounters has been on the rise throughout the entire sport.